Taking the “killer shoe” to the next level, Fantich & Young merge fine art, fashion and design to present luxury consumer goods augmented with ritualistic items to represent Darwin’s notion of “survival of the fittest” and call into question controversial social issues dealing with the free market economy. 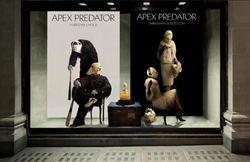 Designed for ‘‘the discerning client with the taste for power and exclusivity,” the Apex Predator collection includes shoes, masks, two-piece ensembles, perfume and other meticulously embellished accessories. Barrett Barrera Projects, a St. Louis-based multidisciplinary consulting company specializing in arts, culture and contemporary fashion, is returning to Miami Art Week to present FANTICH & YOUNG: APEX PREDATOR | DARWINIAN VOODOO as one of the art installations the company will unveil in Wynwood during Art Basel from December 6 to 10, 2017. Simulating a luxury lifestyle boutique, APEX PREDATOR | DARWINIAN VOODOO is a conceptual pop-up exhibition employing multimedia sculpture, photographic prints and a promotional advertising campaign to present a primeval yet contemporary collection that merges the creative disciplines of fine art, design and fashion. Mariana Fantich, born and raised in the Ukraine, is an artist and digital media specialist and Dominic Young is an English musician and artist. Since 2008 they have collaborated under the name Fantich & Young and are currently based in London’s East End. The duo juxtaposes and manipulates symbolic ready-made objects – including Saville Row suits and Jimmy Choo shoes – in order to parallel both natural and social evolution, calling into question the theory of natural selection with nods to ceremonial ritual and the supernatural – a concept they term Darwinian Voodoo. Their Apex Predator project, an outgrowth of Darwinian Voodoo, was inspired by the 2008 financial crisis. Luxury consumer goods augmented with ritualistic items such as teeth, bones, and hair represent the banking community and its escape from criminal prosecution. The financiers thus become the titular Apex Predator – topping the food chain, facing no real threat and possessing perhaps a touch of the supernatural. If the free-market economy is indeed a forum where only the strongest survive, and our urban habitats are a brutal jungle, Fantich & Young’s Darwinian Voodoo seems to perfectly address the needs of an exclusive clientele who reside at the very top of our society’s food chain. The pop-up will be open to the public: Wed - Sat 12:00 pm - 7:00 pm and Sunday 12:00 pm - 4:00 pm. VIP Breakfast event will be held on Thursday morning, December 7th from 9:00 - 12:00 pm. Fantich & young: Apex Predator I Darwinian Voodoo will unveil in Wynwood during Art Basel from December 7th - 10th, 2017.